The X-Men film series is an odd duck. It has survived apparent franchise killing failures, back to back in X-Men 3 and X-Men Origins: Wolverine, and turned a reboot into a very X-Men like retcon of the series history. Throughout all of this, the movies have kept a more restrained take on super heroics than something like the usual Marvel film. 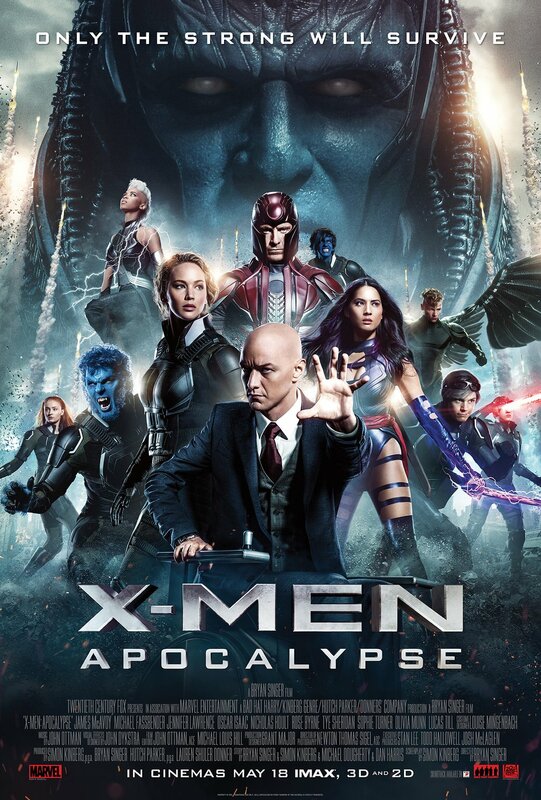 X-Men Apocalypse goes into full superhero mode, with mixed and confusing results. After a brief opening in ancient Egypt that shows something of an origin for the titular villain, X-Men Apocalypse picks up some ten years after Days of Future Past, or at least ten years after the past portions. In that time, everything has changed once again. Mystique is now a famous hero who works to save mutants by herself, Xavier has restarted his school and Magneto has disappeared to Poland to live a quiet life. Those are the three characters that have driven all of the reboot movies and they continue to do so here. I don’t know, though, how much their characterization is a continuation of what has come before and much is just endlessly repeating the same thing. Xavier, Magneto and Mystique all seem to bbe all but repeated their arcs each movie. While that is true to the comics, it makes for a somewhat frustrating viewing experience. Really, X-Men Apocalypse is a big mess. It feels like three different movies mixed in a blender. Magneto’s, Xavier’s, Mystique’s, Apocalypse’s and the new kids’ stories don’t all mesh together. There are just a few too many plot threads for all of them to get the attention they need. The ones who suffer the most for this are all of the new mutants. There is some insight into Cyclop’s character, or at least his relationship with his brother, but every other character introduced in this movie is a non-entity. They take up quite a bit of run time, but they are not developed at all. The same could be said for Apocalypse and his horsemen. Even Magneto’s character arc doesn’t go that many places. He processes his grief enough to decide he doesn’t want to kill absolutely everybody. Flaws notwithstanding, X-Men Apocalypse is still fairly enjoyable. It wins some points for being a fun sort of nonsensical and silly. It aims for grandeur and misses, but it ends up in a not unenjoyable place. The young mutants seem interesting; even if they are not given the time to fully develop. And there is something to be said for the sheer level of apocalyptic destruction that goes on in this movie. At no point do Apocalypse’s methods appear to help him achieve his proposed goals, but again that is just the movie staying true to the comics. Still, for a film series that has not hesitated to stray from it inspirations, it is sad they could get this character right even for the movie. The whole film is something like that. It is all wasted potential. The only things this movie does close to right are the things it has been doing over and over since this first film. I don’t need to see the conflict between Xavier and Magneto play out again, I’ve seen it enough. Hopefully, the next film can find some new ground to explore and maybe not bungle that exploration quite so badly.